Twospotted spider mite is an occasional pest of both corn and soybean in Iowa that is exacerbated by dry conditions. Most parts of Iowa are considered abnormally dry right now, according to the National Drought Mitigation Center in Lincoln, Neb. Soil moisture conditions this spring are similar to the last drought that hit Iowa in 1988; the same year Iowa experienced a statewide outbreak of spider mites. Spider mites generally reach economically damaging levels in late July or early August when conditions are favorable for their growth. However, twospotted spider mite can start building populations in June during years with early-season temperatures greater than 85°F, humidity less than 90 percent, and low moisture levels. These are ideal conditions for the twospotted spider mite, and populations are capable of increasing very rapidly. Twospotted spider mites have been reported by several crop consultants in southwestern Iowa this week. A hand magnifying lens is recommended to scout for the minute (< 1/60 inches long) twospotted spider mites. They can be mistaken for specks of dirt to the naked eye (Photo 1). 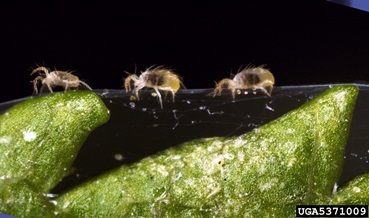 Twospotted spider mite larvae have six legs and nymphs and adults have eight legs. Mites can be removed from collected leaves by shaking the leaves onto a white piece of paper and then looking for moving mites. Twospotted spider mites are typically a cream or green color when feeding on corn or soybean. They can also be an orange to red color when conditions are unfavorable for their growth. Photo 1. Twospotted spider mites have two dark spots on the top of the body, regardless of body color. Photo by Frank Peairs, Colorado State University. 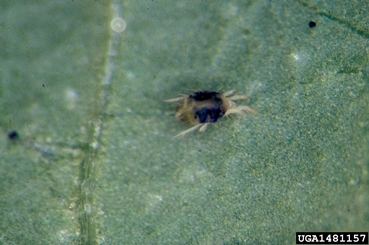 Twospotted spider mites begin feeding on the bottom of the plant and move to the top as the plant's health deteriorates. Although they lack wings, twospotted spider mites disperse with the wind to move from dying plants to areas with healthy plants. 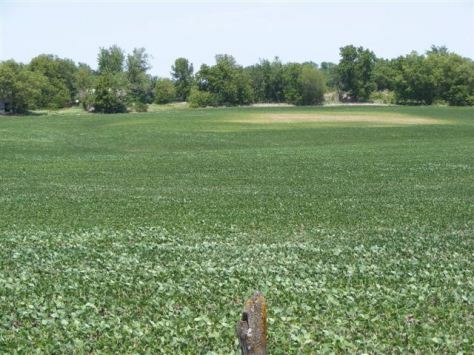 Therefore, it is important to scout healthy areas of an infested field that are downwind from damaged areas. Early symptoms of twospotted spider mite damage will appear as small yellow dots or stipples on the lower leaves of the plants. Prolonged feeding will cause the infested leaves to turn completely yellow, then brown, and eventually the leaf will die and fall from the plant. The webbing is visible on the edges and underside of leaves and is an indication of prolonged colony feeding (Photo 2). Photo 2. Plants heavily infested with spider mites are typically covered in webbing. Photo by David Cappaert. There are not established economic thresholds for twospotted spider mites in corn and soybean, but scouting for initial infestations is very important to avoid yield loss. Twospotted spider mite is capable of reducing soybean yield by 40 to 60 percent when left untreated; drought-stressed plants could experience even more yield loss. Organophosphates are the recommended insecticidal chemistry for twospotted spider mite control. Examples include dimethoate and chlorpyrifos. These products may not kill the eggs, thus a treated field should be scouted 7 to 10 days after application to determine if a second application is necessary. As always, refer to the label for the appropriate rates and re-entry intervals. Pyrethroid insecticides should not be used to control twospotted spider mites as they are not as effective and can actually flare populations. Under dry conditions, foliar treatments are recommended when plants have substantial stippling or leaf-yellowing and spider mites are active (Photo 3). Because a naturally-occurring fungus can control populations, treatment of twospotted spider mites may not be required when temperatures drop below 85°F and humidity levels are greater than 90 percent for an extended time. Mites that are infected by the fungus will appear brown and will not move on the piece of paper used for scouting. Photo 3. Foliar insecticide treatments should be made to fields before prolonged spider mite feeding causes yellowing or leaf drop. Photo taken by Tracy Cameron on June 6, 2012, in Richardson County, Neb. Adam Varenhorst is an entomology graduate student. Matt O'Neal is an associate professor of entomology with research and teaching responsibilities. Erin Hodgson is an assistant professor of entomology with extension and research responsibilities; contact Erin at ewh@iastate.edu or phone 515-294-2847. Links to this article are strongly encouraged, and this article may be republished without further permission if published as written and if credit is given to the author, Integrated Crop Management News, and Iowa State University Extension and Outreach. If this article is to be used in any other manner, permission from the author is required. This article was originally published on June 8, 2012. The information contained within may not be the most current and accurate depending on when it is accessed.